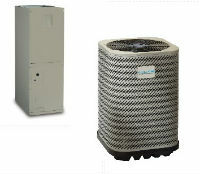 Here you will find our line of quality air conditioners and heat pumps. All of our equipment uses environmentally friendly R-410a refrigerant. Please visit us often as we continue to update our air conditioning parts and add more products. We continuously search for air conditioning and heating equipment that provides a great value, quality construction, and affordable price. Whether you are looking for a 13 SEER, or 2 stage 16 SEER piece of cooling and heating equipment, you will find great options at HVAC Parts Online. HVAC equipment involves highly technical trade skills for proper installation. We HIGHLY RECOMMEND you hire a licensed and insured heating and air conditioning contractor to install the equipment and air conditioning parts listed on these pages. In addition to a proper installation, the registering of the products by a licensed contractor will ensure that your equipment warranty is valid. Licensed contractors will also pull the necessary permits and schedule the required inspections that ensure a proper installation and protect you, the consumer. By purchasing these products you agree that the seller cannot be held liable in any way for disregard of these recommendations.